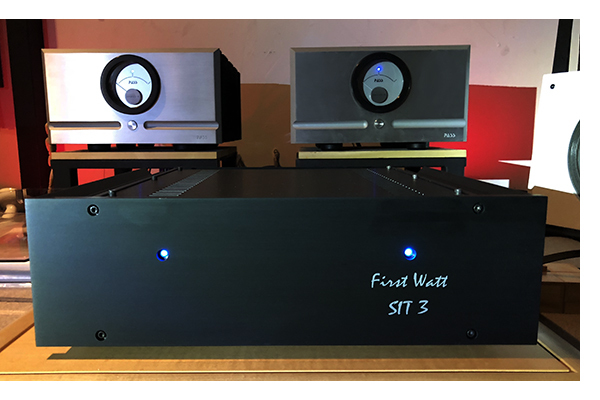 On one level I want to share the new SIT-3 power amplifier from Nelson Pass’ First Watt division with the world and avail you all to its awesomeness. This $4,000 box will not be for everyone. With only 18 watts per channel into 8 ohms and 30 per channel into 4, some listeners will be excluded. But for SET listeners contemplating crossing over, this will be like dropping a V8 into a Smart Car. If you can live with this level of power, call Pass immediately and get in the queue. You will not be disappointed. Now, there might be a few doubting Thomases’ saying “But those First Watt amps are a little thin.” With the wrong speakers, they certainly can be, and in a direct comparison to the SIT-2, the -3 is in a league of it’s own. This one has a fullness that others lacked. You don’t realize it till you hear it. While anxious to pair the SIT-3 with the highly efficient Pure Audio Project Trio 15s, I couldn’t wait. Finishing the photo shoot, I plugged it right in to the main system (formerly with PASS XA200.8s) via the Focal Sopra no.3s, which have a sensitivity of 92db/1 watt and proceeded to by hypnotized by the mixture of drive, clarity, and sheer space that this amplifier delivers. Think all those cliches again. Yeah. The First Watt SIT-3 might be the amp that helps you to kick the bottle. Previous News Item: More from Raidho! 2 Responses to Worlds Best Amplifier? Hi Vincent. I think that if this amplifier will work within your power parameters you will be very excited about what it can do... Let us know what happens.